Says Dan Sperry: "Magic — it's visceral and it's analog." Dan Sperry is not trying to fool you with his magic tricks. He doesn't think you'll be tricked into believing that he possesses supernatural powers necessary to produce a dove out of thin air, as he is wont to do. Sperry just wants you to be entertained. He wants you to believe in the power of magic tricks — and he's fine with you calling them "magic tricks," by the way — even if you can easily be blown away by the new Star Wars or a new virtual reality app on your phone or whatever other piece of amazement that technology can provide you. Compared to those things, magic is actually quite real, says Sperry, who at 30 already is a seasoned magician. "In a live show, you know that the person sitting next to you got picked at random. It dismisses any excuse because it's happening right in front of you. That's what's really great about magic — it's visceral and it's analog," he says. 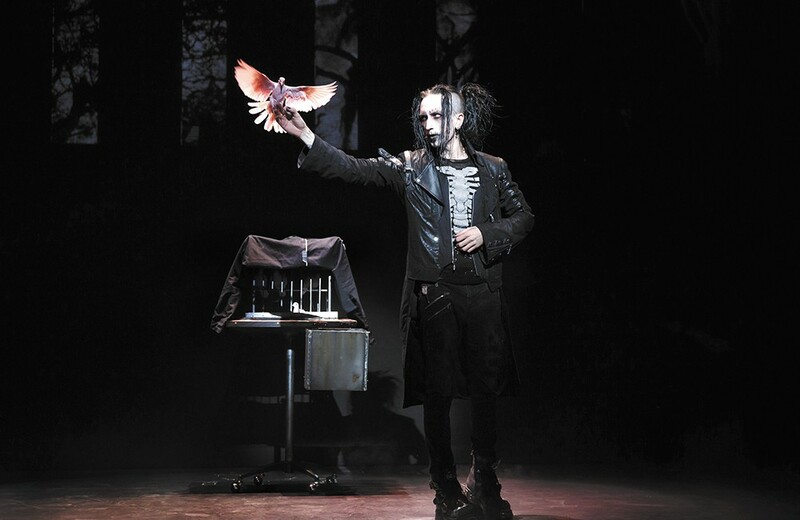 Sperry is currently touring with The Illusionists, a troupe of diverse magicians whose expertise ranges from daring escapes to guys who can straight-up disappear. Dressed like a late-'90s Marilyn Manson, Sperry is a bit of an outlier — "I'm a weirdo. I've accepted this," he says — who appeals to a younger and perhaps more daring group of fans. He came into the mainstream after a strong showing on America's Got Talent during which he chewed up a Life Saver, then appeared to somehow thread dental floss through his neck, only to yank it out with the Life Saver hanging on the floss. Growing up in Minnesota, Sperry didn't have many other magicians to look up to. In fact, he's mostly self-taught. Because of that, he's been able to set himself apart from other magicians. "There was no magic scene. I went through a lot of trial and error — a lot more error. I learned magic by watching VHS tapes and reading books," he says. By his teens, Sperry was already performing professionally and landing headlining gigs. He cultivated a following by opening for bands and DJs, billing himself as a "shock-illusionist," a designation that's best exemplified by the stunt in which he pulls down his lower eyelids and "blood" streaks down his cheeks. Sperry appreciates a good show, and that's what he wants to deliver. For the magic to work, there has to be an investment from the viewer, whether that's somebody 20 rows back in the theater, or, better yet, the guy who gets stopped on the street to participate. This has been going on for centuries. "Back in the day [a magician] would borrow a handkerchief and that was a big deal, because people valued that. Now we have currency that's of value, so you borrow someone's $20 bill, or their $100 bill, or their credit card, or their phone, and do the trick with that," he says. If you think someone has just made your money or new phone disappear, or set it on fire, you're going to buy into the entertainment. Sperry drives this point home again and again; no matter how spooky the guy looks on stage, his pragmatism when it comes to magic is unexpected.